Spy is hysterical with things that go Boom! It’s rated R so don’t watch it with the kids (there’s a few naughty bits in there) and push it thru to the end to see a small clip that will crack you up! Earlier this year, 20th Century Fox released its summer blockbuster comedy "Spy" in theaters. While it only drew in $110 million and change domestically, "Spy" banked in $236.5 million worldwide making this little $65 million comedy worth its weight in goooooooooold! If you haven't gotten to see "Spy" yet, you are missing out on one of the most fun movies of the summer! Somehow, director Paul Feig (known for directing The Heat, Bridesmaids and is at the helm of the new Ghostbusters film set to debut in 2016) has found the perfect formula of just enough summer blockbuster action mixed with just enough comedy to make the fantastic spoof of a James Bond movie! 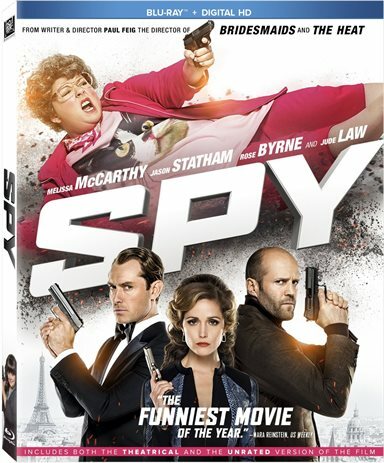 "Spy" starts out with Agent Bradley Fine ("if I do say so myself"… played by Jude Law) confronting the bad guy with the nuke, and, after an unfortunate mistake, finds himself being guided out of trouble by the voice in his ear, analyst Susan Cooper (played by Melissa McCarthy, best known for Bridesmaids and Mike & Molly). Susan back at headquarters is obviously crushing hard on Agent Fine, so much so that she would wear the ugliest piece of jewelry known to man! However, on Agent Fine's next mission, things go horribly wrong and Rayna Boyanoy (Rose Byrne from Insidious, XMen First Class and 28 Weeks Later), the daughter of the bad guy with the bomb, takes him out! Susan is called into a meeting with her boss Elaine Crocker (played by Allison Janney from West Wing) and other agents, including Rick Ford (played by Jason Statham, best known as the Transporter), to discuss the next move. Since Rayna Boyanov has made it clear that she has all the active agents names and alias's, they decide that Susan Cooper should go out in the field to track and observe…ONLY! Of course, this makes fellow agent Rick Ford angry as hell, and defiant enough to follow her anyway, vowing that Susan will mess up the mission. From there, it really does follow as if it were a James Bond film with locations like Paris, Rome and Budapest, fast cars, big action scenes….you even get a casino scene along with what looks like a martini but its definitely not shaken or stirred! While I have never been a dedicated fan of Melissa McCarthy, this vehicle is just perfect for her. It allows her to play a timid character that jumps into insulting depending on what the undercover profile requires, which is fantastic because whenever a comedian sticks on one specific type of character, it gets old pretty fast. On the flip side of the coin, Jason Statham is always known for his big action films, his hard straight-forward no nonsense type of gritty heroes, but in "Spy" he gets to play the over the top, clutzy and sometimes just idiotic agent. He wants to be the the one that will save everyone, he will even boast about how much he has done in the past, but be dammed if he can pull it off when it counts! Jude Law gets to play the quintessential James Bond like agent. Smooth, good looking, here to save the day and breaking hearts along the way. Its perfect for him! Just as Rose Byrne's portrayal Rayna Boyanoy! You love to hate her! So cold and callous with that birds nest of a hair do. You'd want to see her get it in the end until you see her mother, which will explain everything! Other notables is Bobby Cannavale as Sergio De Luca, an agent brought in to help Susan Cooper and yet the most he accomplishes is to lewdly hit on her every chance he gets. Miranda Hart who plays Susan Coopers coworker and drink buddy Nancy B. Artingstall. And 50 Cent even makes a funny cameo appearance towards the end. While "Spy" is being released on DVD and Blu-ray, its also being released in an extended "Unrated" version. While generally these are a ploy, adding in maybe 2-5 minutes of cut footage which is generally not needed, in this version….that is true as well. The unrated version adds nothing of any importance to the Original so if you get the Original, your not missing out on anything! The Blu-ray also comes with a few special features that include a Top secret gag reel, Extra top secret behind-the-scenes gag reel, Susan and Her Men, The Great Rick Ford, Audio commentary; Gallery; Theatrical trailer. At the end of the day, "Spy" shouldn't be a movie for your eyes only! It's a laugh out loud comedy with great action and story, along with fun characters that have a license to kill! I'm hoping they do a sequel for "Spy" because for me this world is not enough, and, who knows, Rayna Boyanoy may die another day! I give "Spy" five martinis out of 5! It is hysterical with things that go Boom! It's rated R, so don't watch it with the kids (there's a few naughty bits in there). Also push it thru to the end to see a small clip that will crack you up! Download Spy from the iTunes Store in Digial HD. For more information about Spy visit the FlickDirect Movie Database.